Few films and their sequels are as equally revered by fans as The Evil Dead and Evil Dead 2. Whether you prefer Sam Raimi's 1981 indie horror landmark or his black humor-injected 1987 sequel, Fright-Rags has something for you, along with new shirts from House, House II, and The Warriors. Fright-Rags returns to the cabin in the woods for more Evil Dead and Evil Dead 2 apparel. There are three new shirts, along with reprints of two classic designs, three pairs of socks, and five enamel pins - including a recreation of the cellar door that opens and closes with real dangling chains. Horror has found a new home as Fright-Rags moves into House and House II: The Second Story. Four shirt have have been created for the pair of '80s horror flicks, including one in the style of a vintage double-feature newspaper ad. 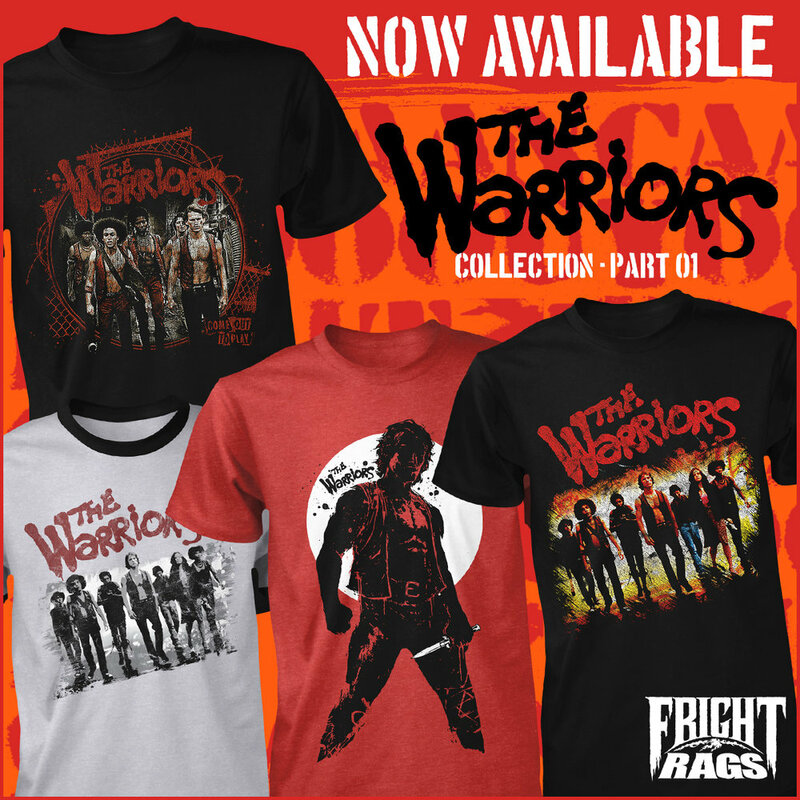 Fright-Rags comes out to play with The Warriors collection. Choose from four new shirts from Walter Hill's 1979 cult classic, ranging from new designs to official artwork. Be sure to return to the site this Friday, August 17, for Fright-Rags’ latest “classick” reprint. Justin Osbourn's Zeke the Plumber T-shirt, inspired by Salute Your Shorts, will be available for three days only. Finally, Fright-Rags has announced that it will be releasing officially licensed apparel from the Halloween franchise - including John Carpenter's original and David Gordon Green's brand new sequel, among other installments - each week throughout the month of October.